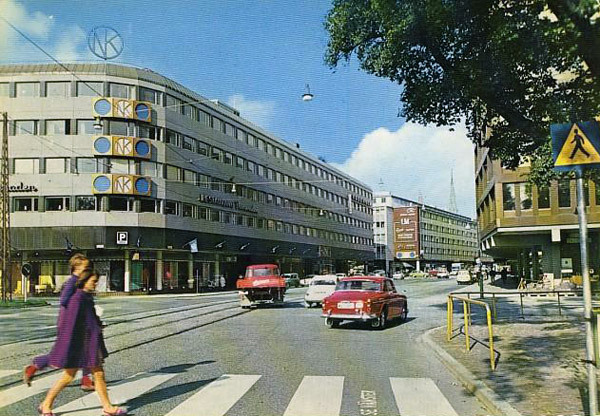 Here are two postcards showing the old NK department store in Malmö, Sweden. NK (Nordiska Kompaniet / The Nordic Company) is one of the oldest merchandise companies in Sweden. The first, and biggest store opened in Stockholm in 1915 and featured Sweden’s first escalators. Soon NK also had stores in Gothenburg and Malmö. The department store in Malmö was opened in 1963, but it was short lived due to very high maintenance costs. I remember visiting NK in Malmö when I was younger in the mid 1980s, I believe that the store was closed just a couple of years later. The building still stands there today, but it has been converted to a indoor shopping arcade called Hansa Compagniet – a very boring and typical looking shopping place.